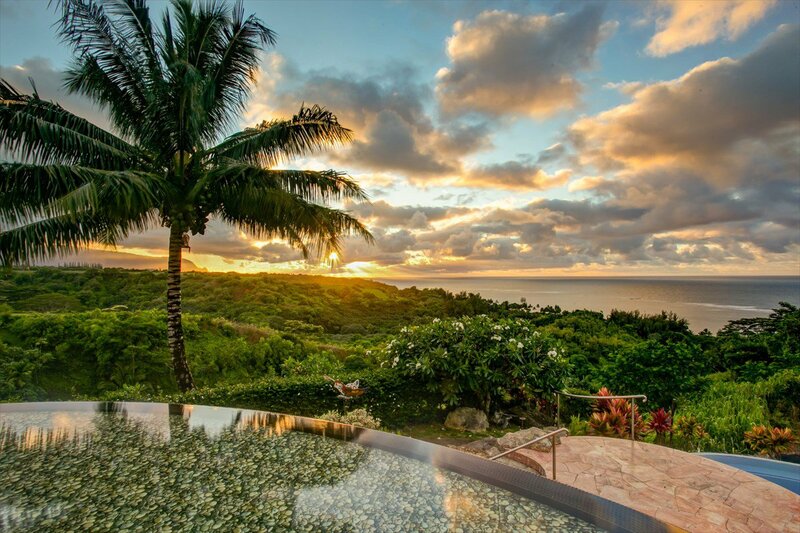 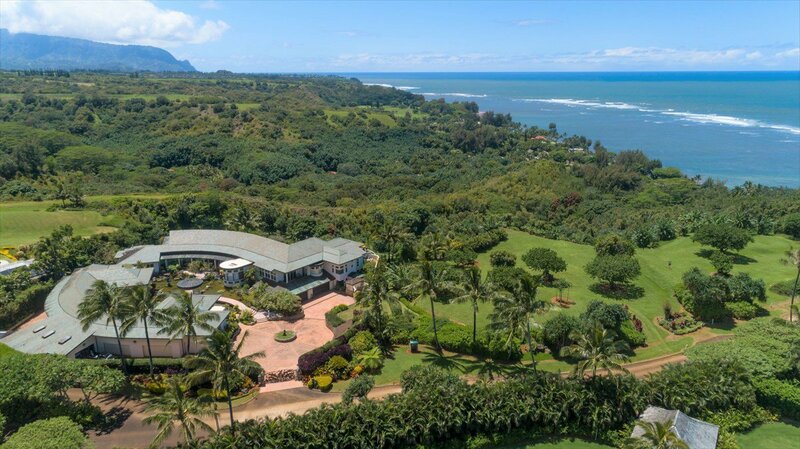 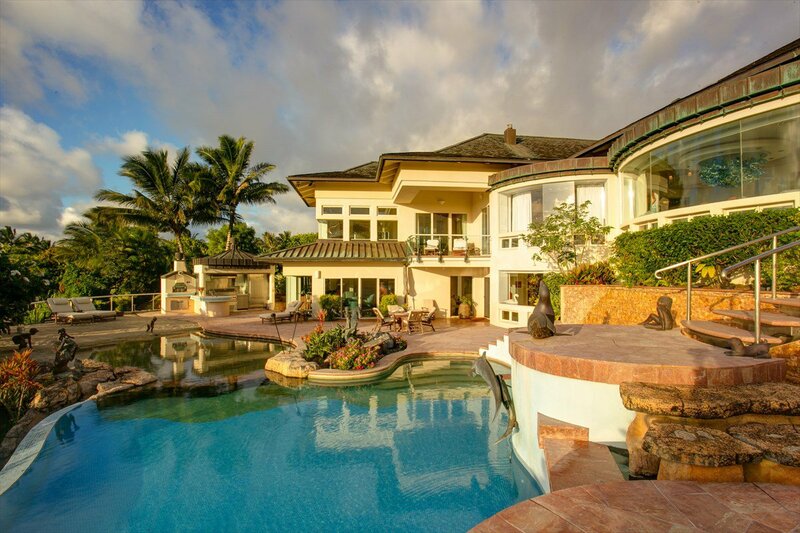 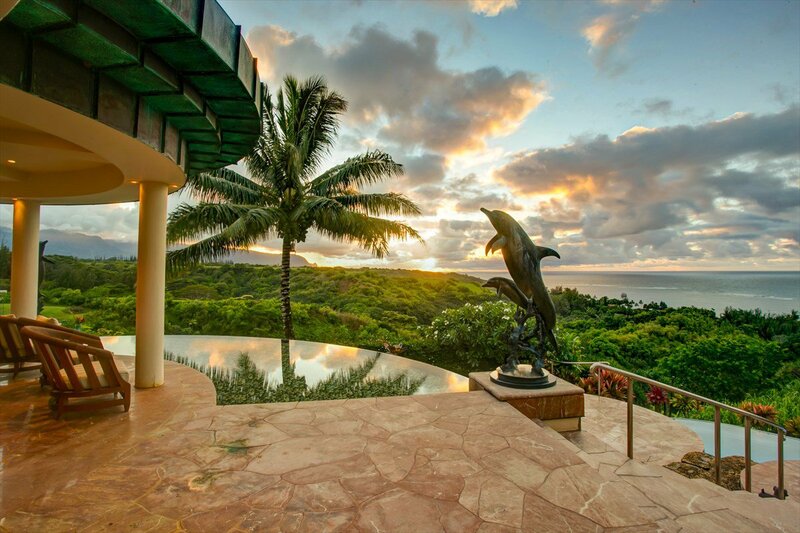 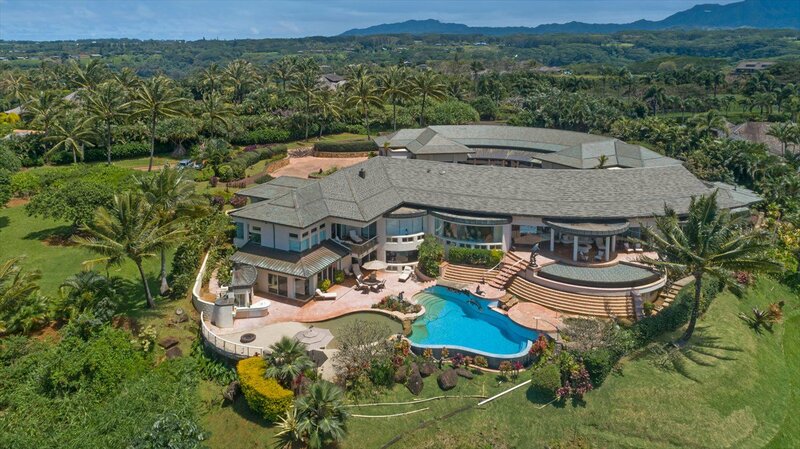 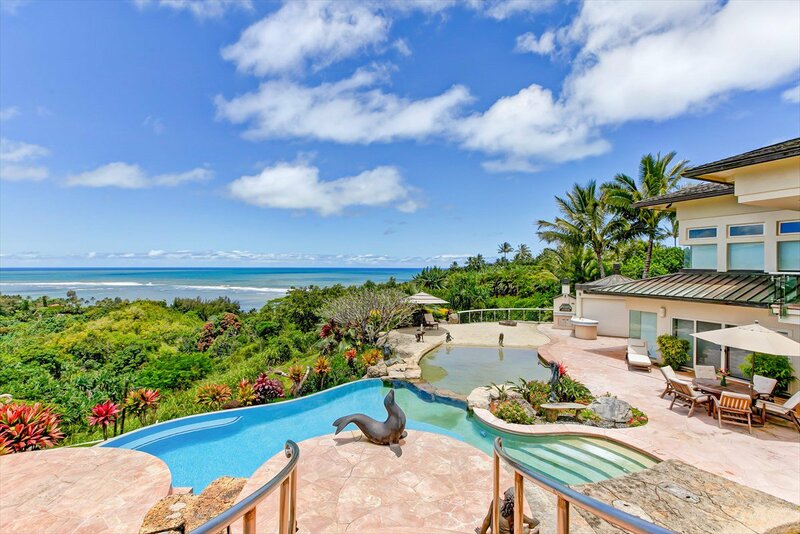 A stunning showplace of architecture and craftsmanship, this sprawling estate offers an elevated living experience in Kauai’s most desirable enclave, “Anini Vista.” Featuring unparalleled views: epic ocean, white water, Anini Reef, Hanalei mountain range and Bali Hai sunsets. 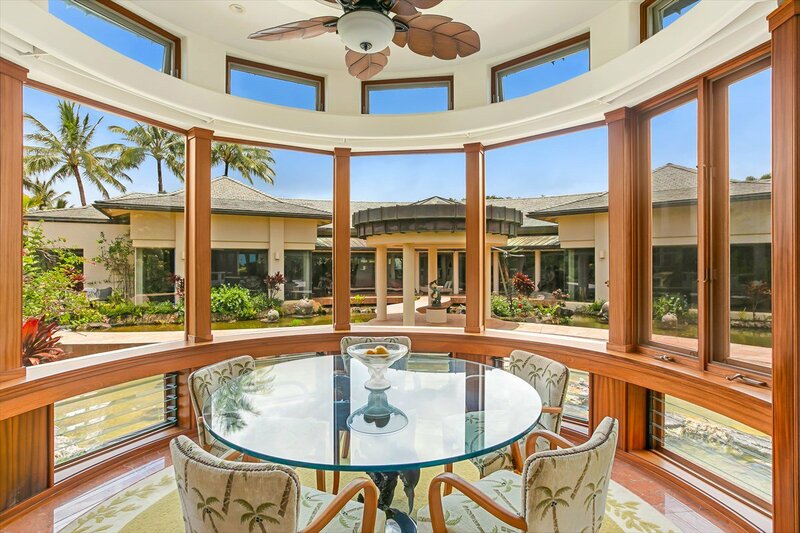 Double gated entries insure complete privacy as you enter the circular driveway. 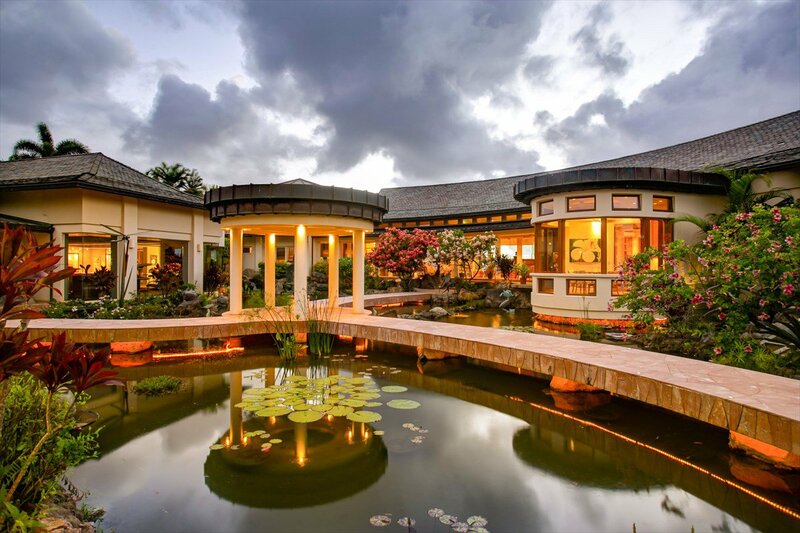 The meandering marble walkway bridges over an immense koi and waterlily pond. 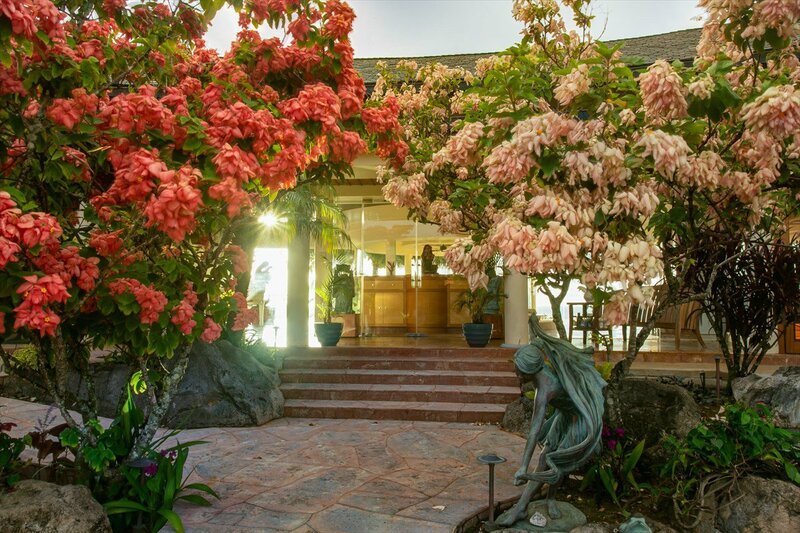 Pausing at the gazebo gives a sense of enchantment and tranquility. 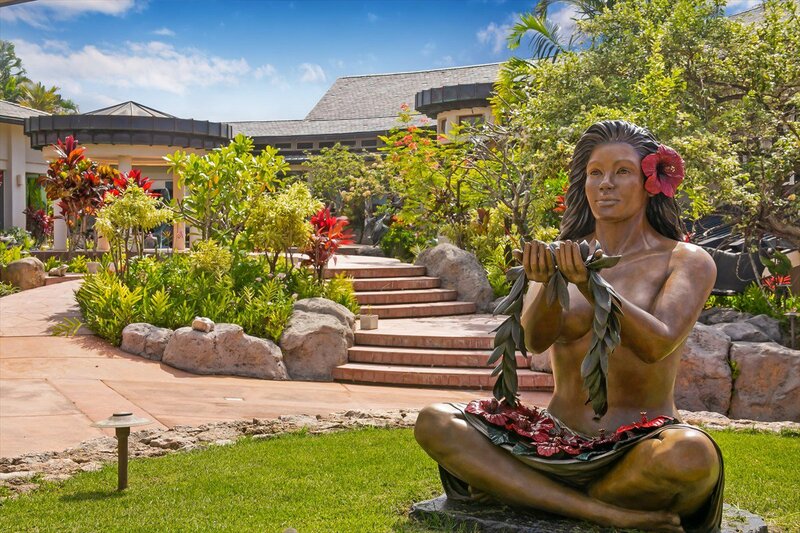 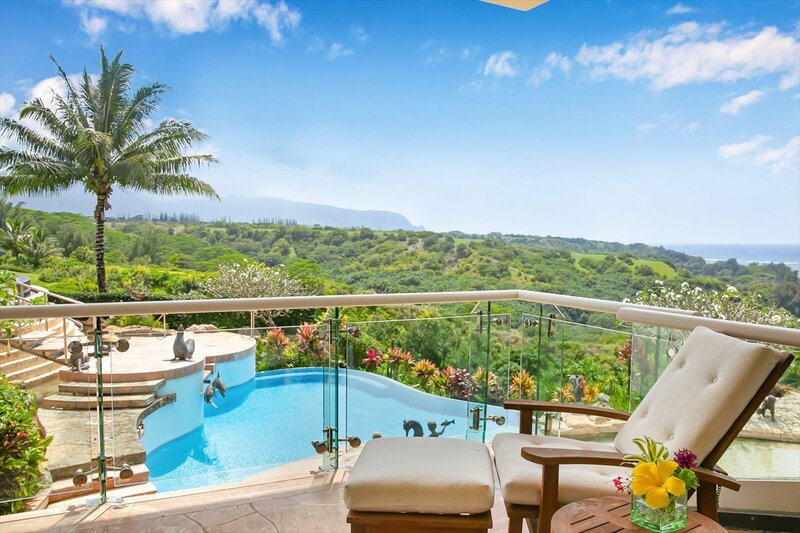 Enter the main residence to an elegant living area designed after the iconic Princeville hotel with extensive lanais overlooking the ocean, mountain views and pools. 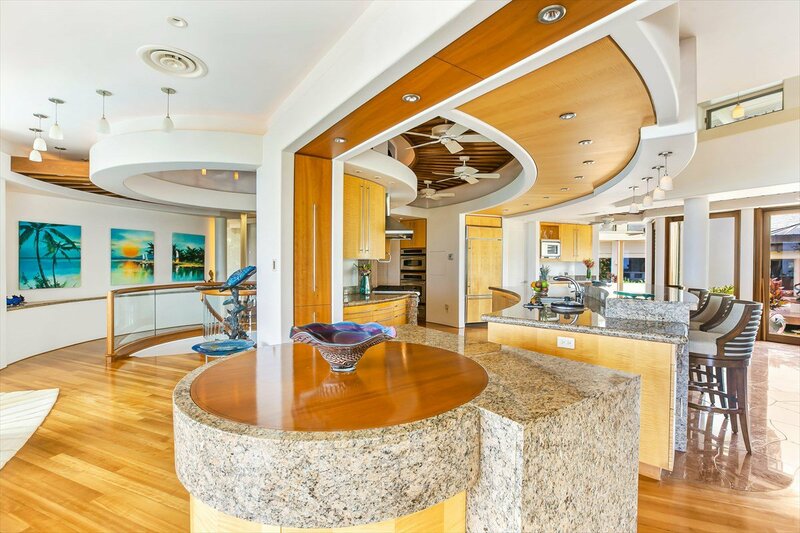 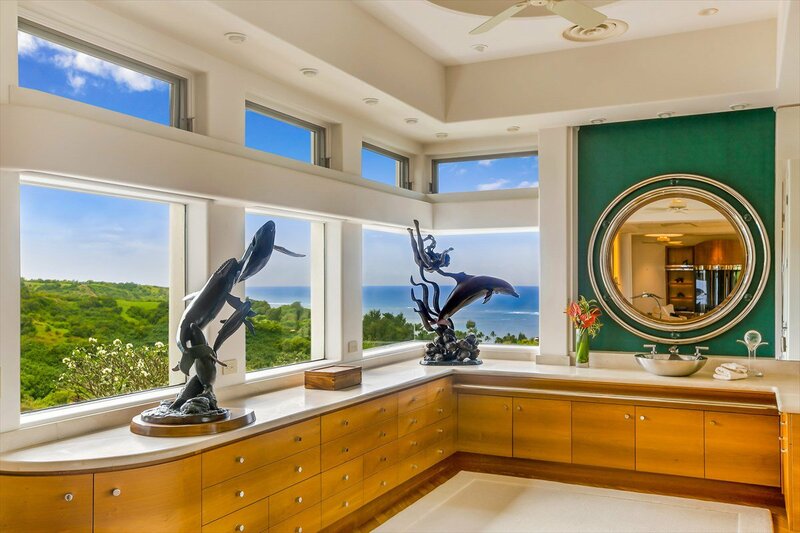 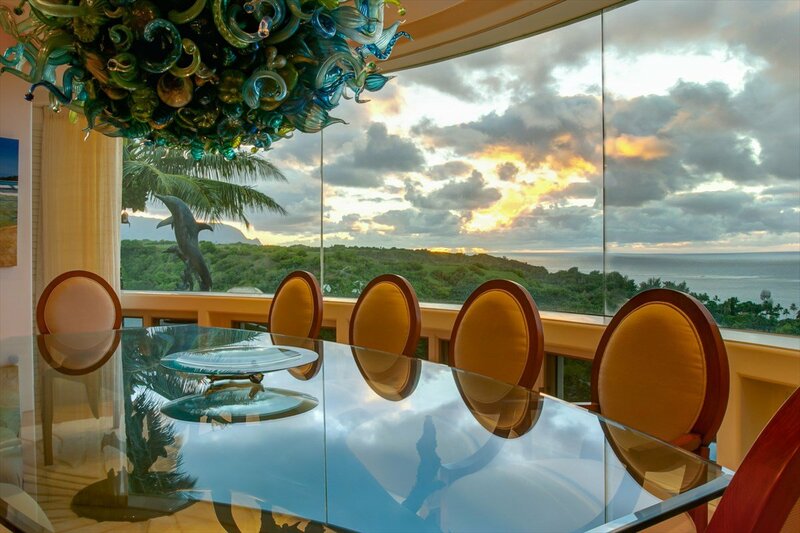 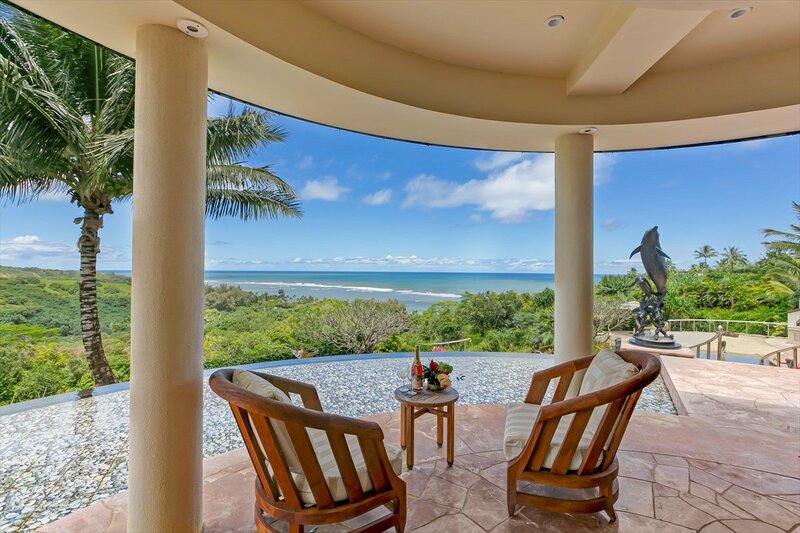 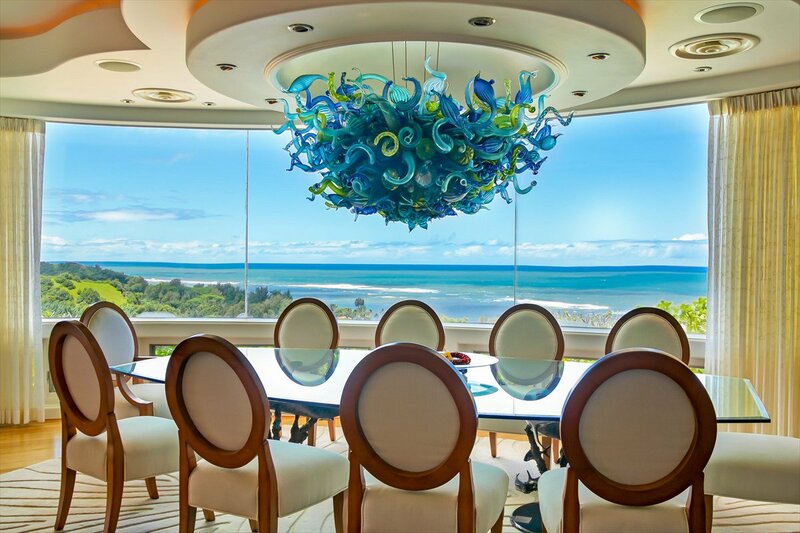 The formal dining area features a wall of curved glass, with sweeping views of Anini Reef. 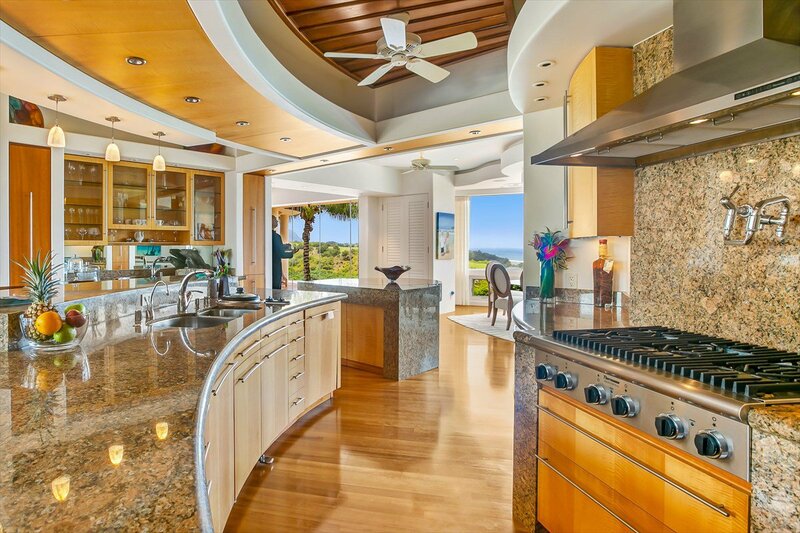 The main gourmet kitchen is complete with top-of-the-line appliances. 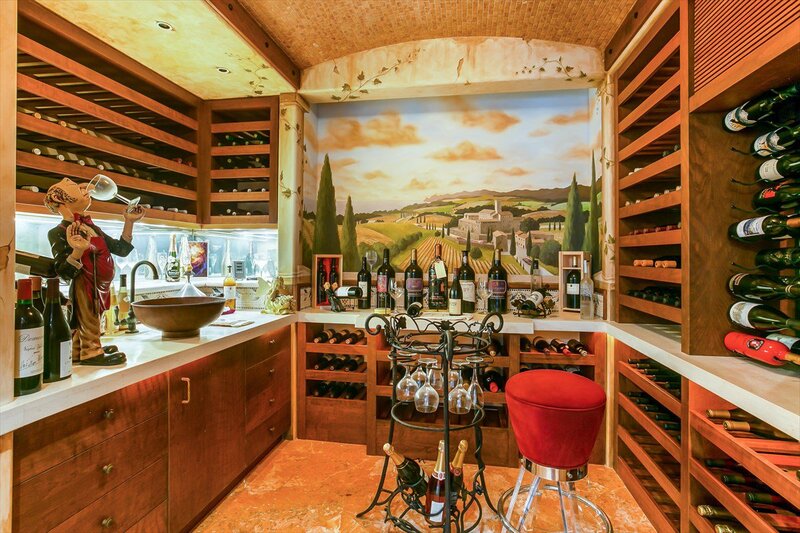 An eat-in bar is ideal for entertaining. 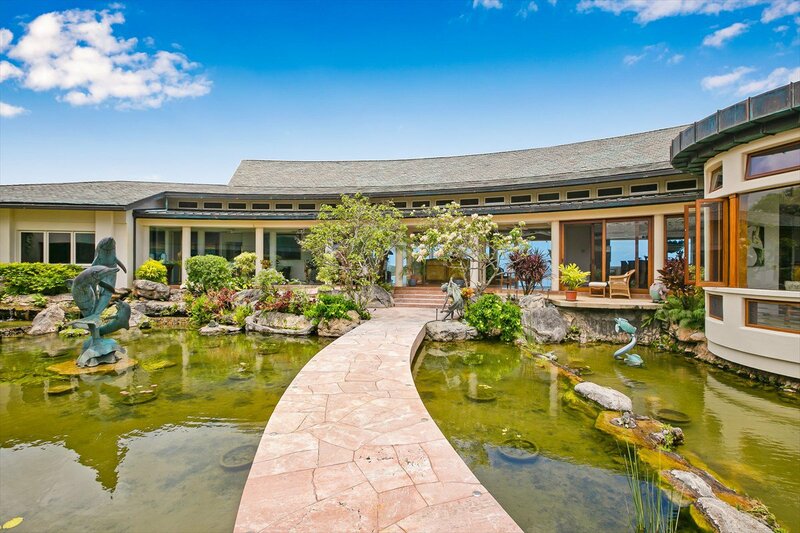 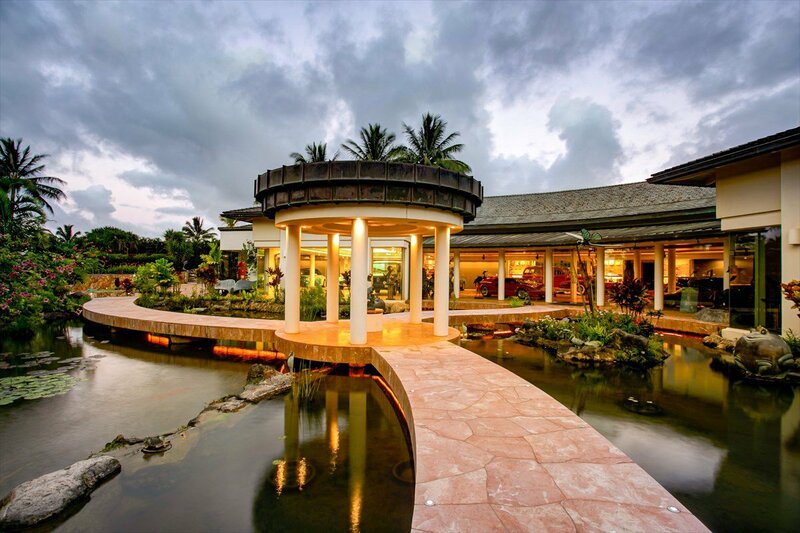 The adjacent breakfast “round room” built just above the koi pond welcomes the day with sunrise views. 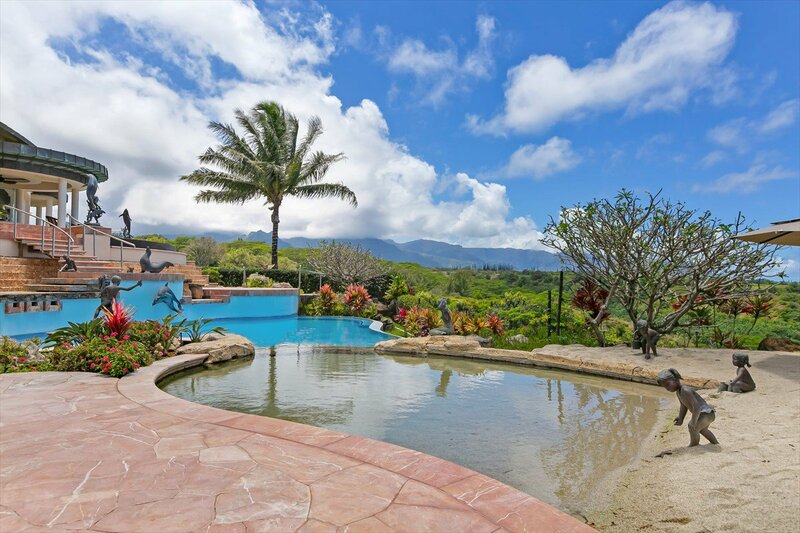 The outdoor living features an infinity pool with unobstructed ocean views and glorious sunsets. 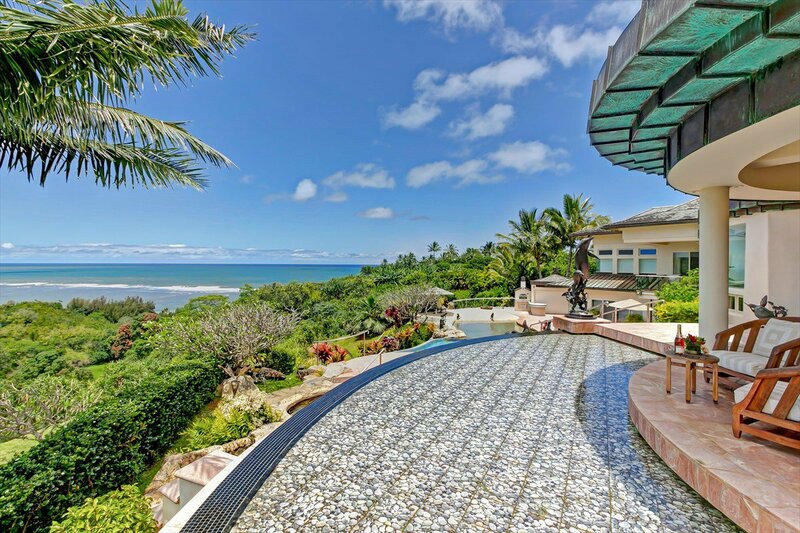 Unwind in the sand-bottom hot tub with a MaiTai. 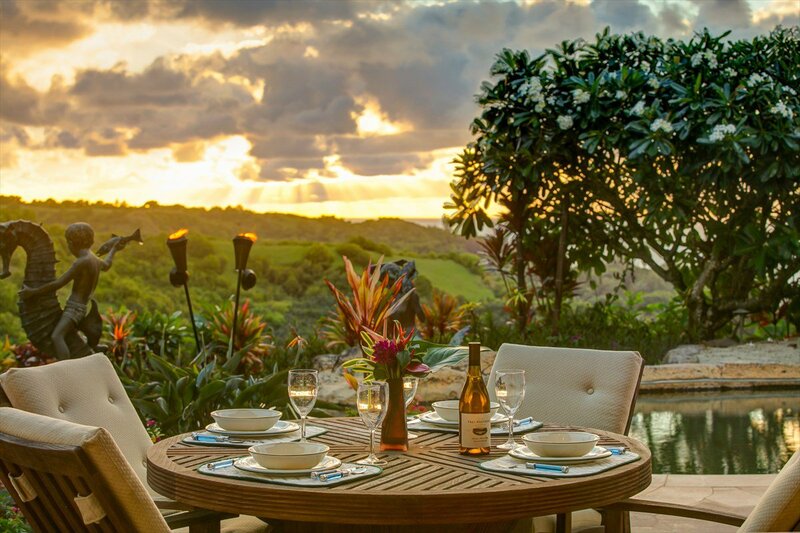 Enjoy the outdoor kitchen with gourmet grill and pizza oven. 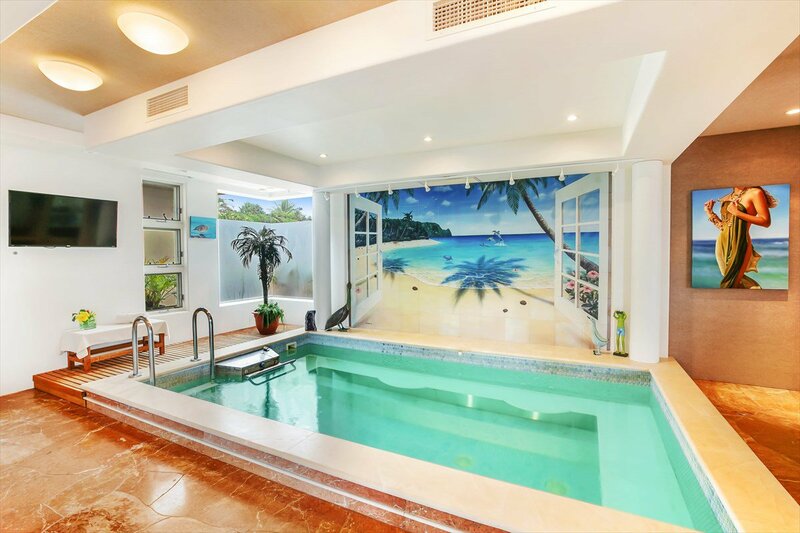 The lagoon-style sandy beach is perfect for children. 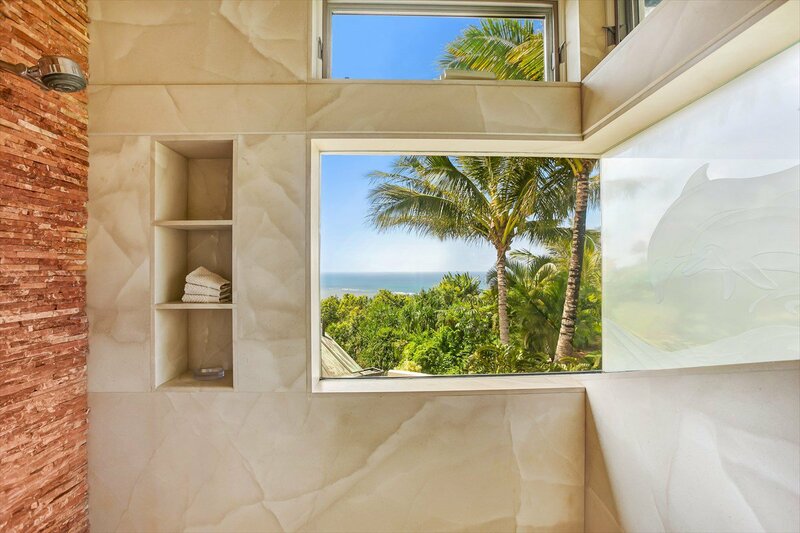 Each bedroom suite offers privacy, featuring individual lanais with views of the ever-changing colors from sunrise to sunset. 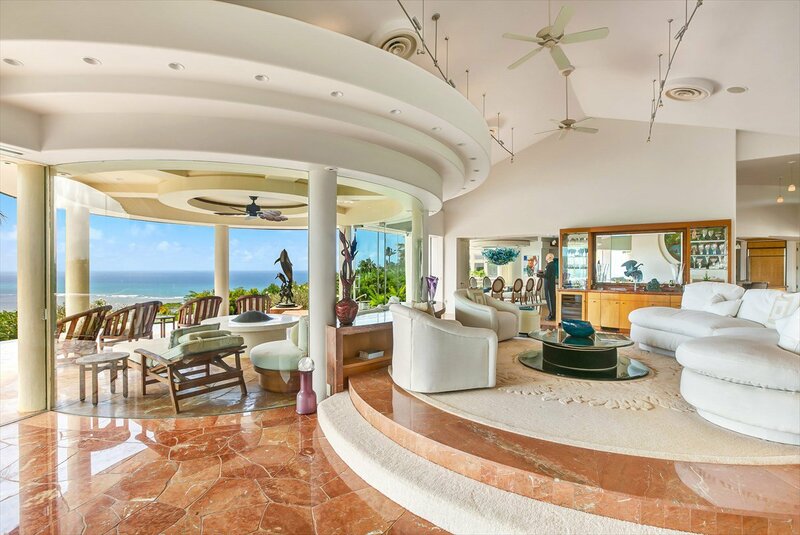 The master suite is its own romantic paradise with views galore, a fireplace and magnificent “his and hers” baths. 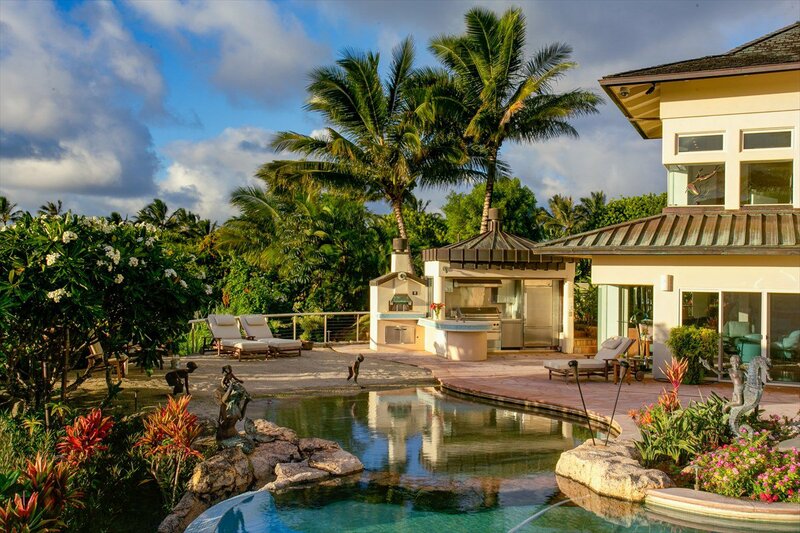 The guest wing is a Hawaiian-inspired “Ohana” living or mother-in-law suite with state-of-the-art bath and kitchen. 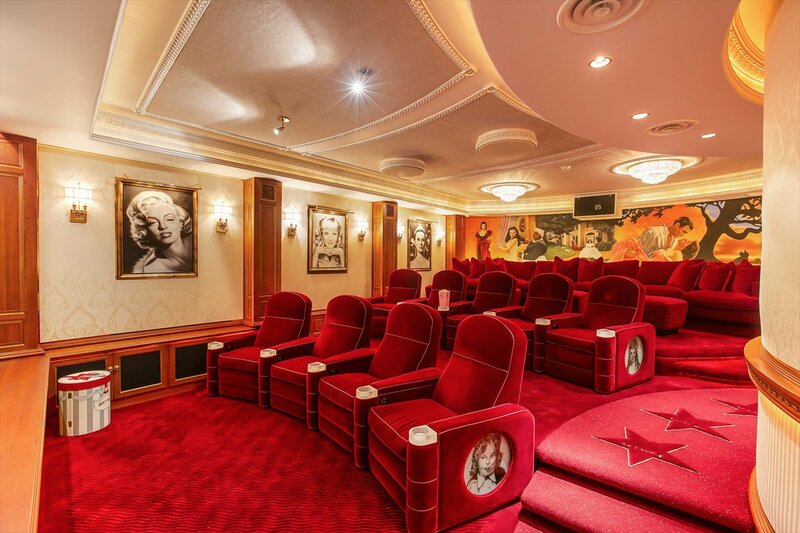 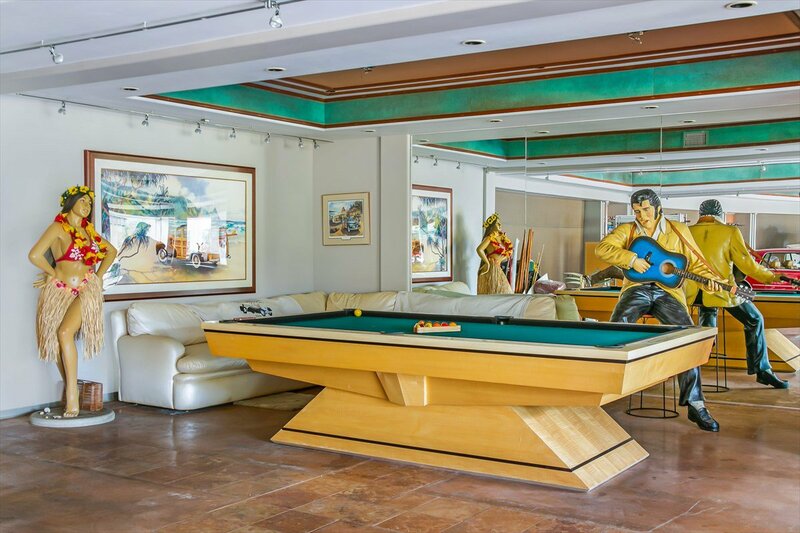 Take the graceful staircase or elevator to the lower level to discover the luxurious Hollywood-style theater with velvet recliner seats, surround-sound and big screen; wine cellar; indoor “endless” pool with fitness center and a large den for family fun. 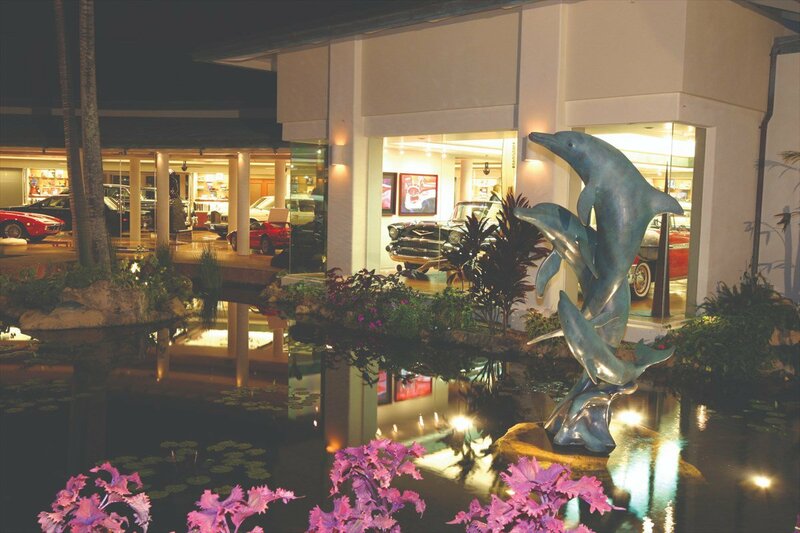 The detached 5,000 sqft showroom is a car collector’s dream, built with the same exceptional quality.